Make the relish In a small saucepan, combine 1/2 cup of the vinegar with the sugar, 1/4 cup of water and the 1 1/2 tablespoons of salt and bring to a boil, stirring to dissolve the sugar and salt. Add the mustard seeds and let cool completely. Transfer to a bowl, cover and refrigerate overnight. Drain before using. In a medium bowl, mix the celery root, celery and half-sour pickle with 3 tablespoons of the drained mustard seeds and the remaining 1 tablespoon of vinegar. Season the relish with salt. Save the remaining mustard seeds for another use. Make the mayonnaise In a mini food processor, puree the egg yolk with the lemon juice, mustard and salt until smooth. With the machine on, very gradually add the canola oil until emulsified and the mayonnaise is thick. Scrape into a small bowl and stir in the truffle. Make the hot dogs Preheat the oven to 350°. Pat the hot dogs and bacon dry with paper towels. Wrap each dog with a slice of bacon in a spiral; secure the bacon with toothpicks. In a large saucepan, heat 3 inches of canola oil to 350°. Fry the hot dogs over moderately high heat, turning occasionally, until browned and the bacon is crisp, about 3 minutes. Transfer to paper towels to drain. Discard the toothpicks. Arrange the buns cut side up on a large rimmed baking sheet. 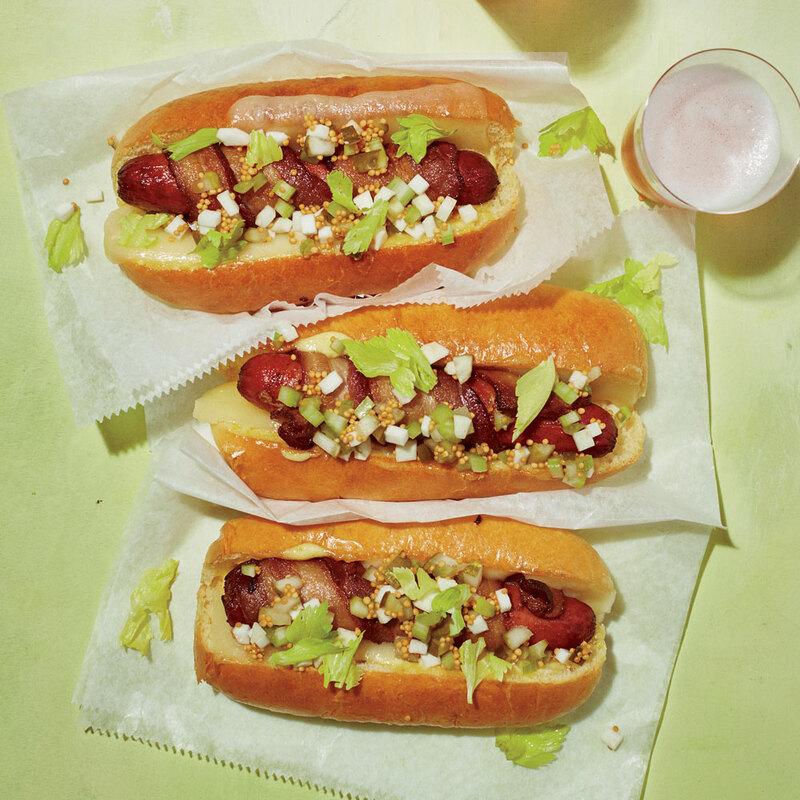 Spread the inside of each bun with some of the truffle mayonnaise and fill with a hot dog and a slice of Gruyère. Bake for about 5 minutes, until the cheese is melted. Top with some of the relish and garnish with celery leaves. Serve right away. The celery relish and the truffle mayonnaise can be refrigerated separately overnight.